Summary: Breast cancer remains the second leading cause of mortality in females in Mexico, aged 30 to 55, and is usually self-detected in later stages. Due to disparities in health care within the country, even patients with early detection may not receive optimal or timely treatment leading to more recurrent or metastatic disease. Surgery remains the best, but underutilized option for definitive treatment in patients with surgically resectable disease. In this case, a patient with advanced disease was successfully resected using a multi-disciplinary approach. Announcement text: a multidisciplinary approach to recurrent metastatic breast cancer with chest wall resection and free flap graft creation. Disclosures: The authors have no disclosures. The patient was a 70-year-old Hispanic female with a past medical history significant for local breast cancer in the left breast, initially diagnosed in 1994. This was treated with chemotherapy and radiation. She was then maintained on tamoxifen until 2000. In 2011, she presented with a recurrent mass in the left breast. There was no other history of chronic or active medical conditions such as HTN, CAD or diabetes. After referral to a surgical oncologist for further evaluation, patient underwent additional evaluation. A PET/ CT scan was positive for a metabolically active lesion in the left breast with an SUV of 9.6 with lytic lesions in anterior ribs with max SUV of 3.0. There was no evidence of distal metastasis to other organs including the brain, lungs, or abdominal cavity on PET or other diagnostic imaging. All pre-operative labs were within normal ranges including alk phos, and serum calcium. After initial surgical evaluation, a multi-disciplinary surgical plan utilizing a general surgical oncologist, thoracic surgery and plastic surgery was devised for surgical resection of breast mass with rib resection and free flap creation. 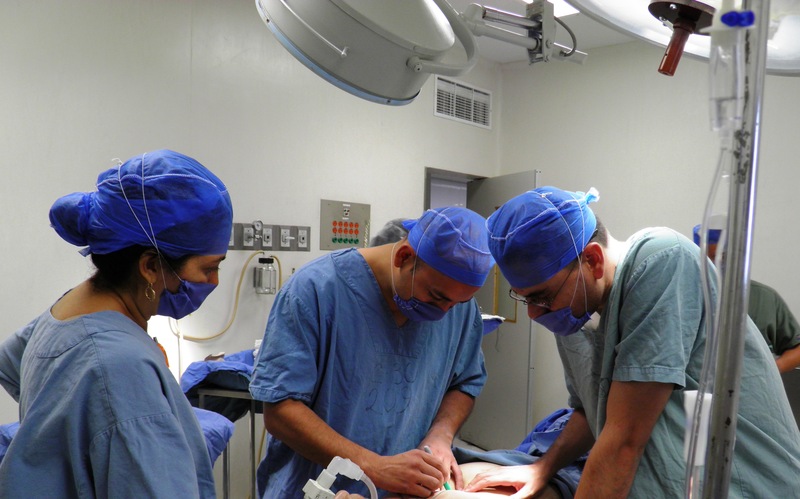 Operative Course: The left breast including all skin, tissue and lymphatics was excised to the depth of the rib cage. Further dissection and resection of the anterior portion of ribs #2, 3 and #4 was completed. 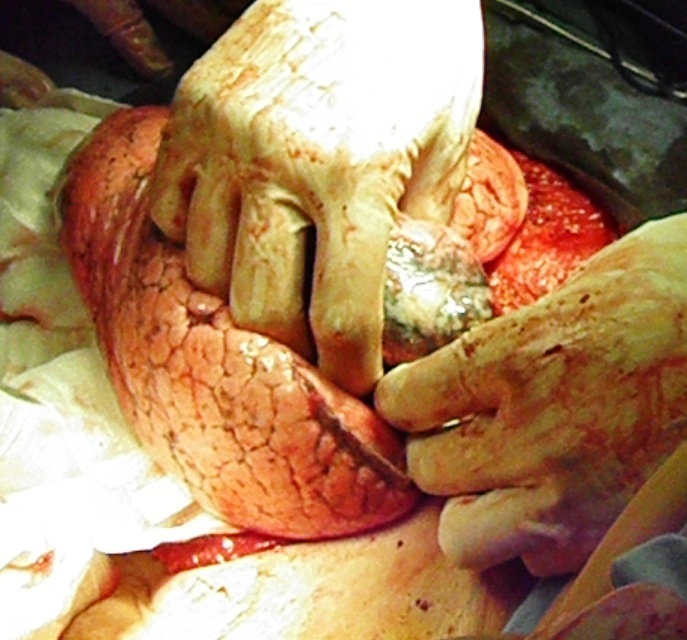 Following rib resection, upon exploration of the left thoracic cavity, the patient was found to have a large greyish-white lesion, estimated at 3.5 cm in diameter in the left upper lobe. The lesion was hard, and located on the peripheral portion of the upper lobe. No additional lesions were found. The decision to undertake pulmonary resection was based on the possibility of complete surgical resection of existing disease. At the time, a discussion was undertaken with the patient’s primary surgeon, and the thoracic surgeon on the feasibility of resection by lobectomy versus segmentectomy. The decision was made to proceed with a lung-sparing procedure as the patient’s baseline pulmonary function was not known. Following successful lung resection and hemostasis, a 32 french chest tube was placed, and surgical mesh was placed for coverage of chest wall / rib defect. After mesh was sutured into place, the patient was re-positioned for harvesting of a free flap from the posterior chest. Abdominal free flap harvest was not undertaken due to patient anatomy. The plastic surgeon involved in the case, Dr. Nastia Gonzalez then proceeded with free flap grafting for breast reconstruction. There was no significant bleeding, hypoxia or hemodynamic instability intraoperatively. The patient was successfully extubated at the conclusion of the case, and transferred to the post-operative care unit in stable condition. Post-operative course was uncomplicated with the chest tube removed on POD#3, and the patient discharged home on POD#5. The patient’s oxygen saturations were within the normal range (92% or above) and she was discharged home without supplemental oxygen. Subsequent post-operative visit was uneventful with no evidence of infection, or impaired healing of the graft or harvest site. As of the date of publication, there has been no further evidence of recurrence or metastatic disease. Conclusions: For patients with metastatic disease limited to adjacent and surgically resectable tissue, surgery remains the best option for longevity and overall survival. However, despite the available and use of advanced imaging studies, surgeons should prepare for and anticipate the possibility of discovery of evidence of additional disease. In this case, a more complete anatomic resection of the newly discovered lung lesion was hindered by the lack of pre-operative evaluation of pulmonary disease. 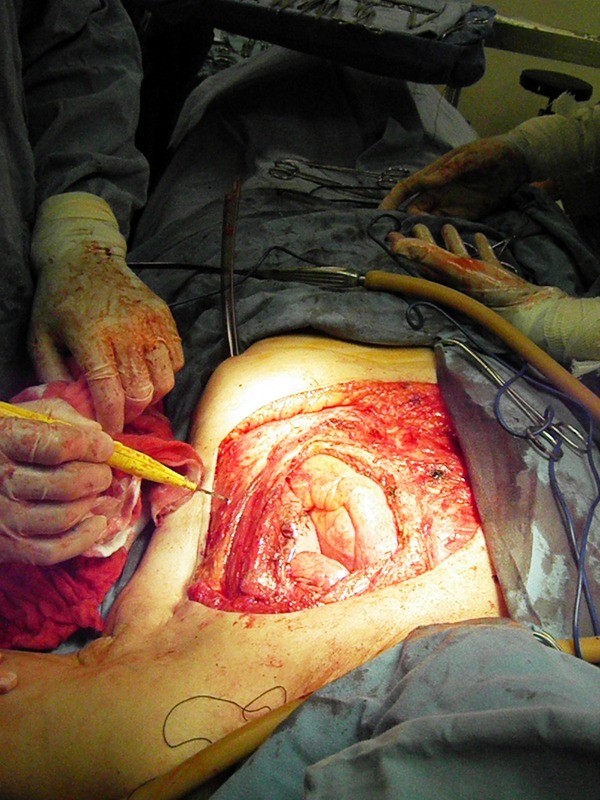 Chest wall resection and defect closure have been managed with a variety of techniques over the years, including muscle flaps, plastic ribcage creation, mesh closures for stabilization after rib resection (Khalil et al.). In this case, which required a radical mastectomy, surrounding musculature was removed for full resection. Tissue was harvested for free flap grafting but this gives lesser structure than attached muscle, so synthetic mesh was used. Historically, hardware installation was plagued with a variety of problems including infection and erosion. However, preliminary reports of evolving hardware for oncologic chest resections may change closure techniques in the future (Fabre et al, 2012). Akiba T, Takeishi M, Kinoshita S, Morikawa T. (2011). Vascularized rib support for chest wall reconstruction using Gore-Tex dual mesh after wide sternochondral resection. Interact Cardiovasc Thorac Surg. 2011 Nov;13(5):536-8. Case report of breast ca with sternal reconstruction. Note the one month post-op photo. Billè A, Okiror L, Karenovics W, Routledge T. (2012). Experience with titanium devices for rib fixation and coverage of chest wall defects. Interact Cardiovasc Thorac Surg. 2012 Jul 19. 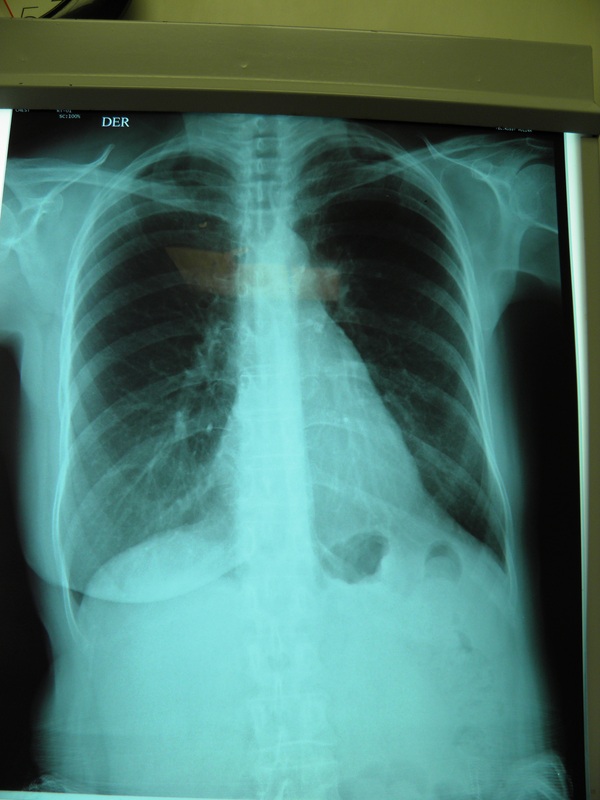 Report of 18 patients with chest wall defects repaired using titanium. (Majority of cases were trauma related). Fabre D, El Batti S, Singhal S, Mercier O, Mussot S, Fadel E, Kolb F, Dartevelle PG. A paradigm shift for sternal reconstruction using a novel titanium rib bridge system following oncological resections. Eur J Cardiothorac Surg. 2012 May 2. No free full text available. Parisian study of titanium bridge system for use after oncological resections. Khalil el-SA, El-Zohairy MA, Bukhari M. (2010). Reconstruction of large full thickness chest wall defects following resection of malignant tumors. J Egypt Natl Canc Inst. 2010 Mar;22(1):19-27. Excellent report on series of 18 patients who underwent major chest wall resections for onocologic disease. Review of available materials and type of resections. Mohajeri G, Sanei MH, Tabatabaee SA, Hashemi SM, Amjad E, Mohajeri MR, Shemshaki H, Jazi AH, Kolahdouzan M. (2012). Micrometastasis in non-small-cell lung cancer: Detection and staging. Ann Thorac Med. 2012 Jul;7(3):149-52. Using bone marrow biopsy for diagnosis of lytic lesions. Müller AC, Eckert F, Heinrich V, Bamberg M, Brucker S, Hehr T. (2011). Re-surgery and chest wall re-irradiation for recurrent breast cancer: a second curative approach. BMC Cancer. 2011 May 25;11:197. Seki M. (2012). Chest wall reconstruction with a latissimus dorsi musculocutaneous flap via the pleural cavity. Interact Cardiovasc Thorac Surg. 2012 Jan;14(1):96-8. Case Report. Transpleural musculocutaneous flap used for defect repair in long term cancer survivor with radiation-related necrosis. This case study has been published with the gracious consent of the patient. However, in accordance to the patient’s wishes, and privacy – no photos showing the pre-operative site (breast) or the graft after surgery will be published.